Touring the West Auckland plant of award-winning winemaker Matua Valley Wines during national Got a Trade Week proved a good way for students like Ruhia Henare-Samuels to learn about a career in winemaking and gain tips for getting started. Ruhia is one of many students, teachers and jobseekers who took part in a Competenz Discovery Tour across the country in Got a Trade Week. These tours were an opportunity to visit a local workplace to learn about the careers available in trades and services industries and the work involved. Matua winemaker Nikolai St George who led the tour says the company was pleased to open their doors to host the students. Got a Trade Week was also a chance to hear from current learners, including apprentices, who are enjoying the benefits of training on-the job in their chosen trade. Trainees earn while they learn and finish their training with a job in their chosen field – not looking for one. 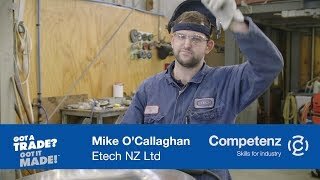 They also gain practical skills they can use from day one and qualifications that are recognised by employers across New Zealand. Competenz customer Matua joined 18 other companies around the country in generously opening their doors to host a Competenz Discovery Tour.